What Occupations Can Cause Hearing Loss? Some jobs out there can put you at risk for hearing loss so it’s important to be aware of what your working conditions are. Is the cause of your hearing loss the same place that you spend 8 hours a day and earn the majority of your income from? If you work in one of these fields, the answer might surprise you! While every occupation comes with a certain degree of hearing hazards, there are some occupations that put employees at an increased risk of hearing loss. More than 22 million Americans every year are exposed to hazardous levels of noise as a direct result of their occupation. What occupations are most at risk for hearing loss? Here’s what you need to know. Manufacturing, no matter what you are actually manufacturing, is a noisy process. Between other workers chatting, loud machinery, compressed air, and everything clanking together, it can create a great deal of noise. 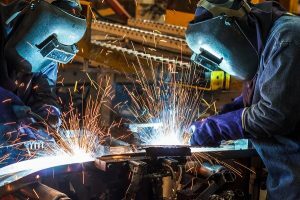 All of those elements combine so that hearing loss is actually the single most common occupational illness for workers in the manufacturing industry. A whopping 80% of manufacturing industry workers actually have noise-related hearing damage. Many times, people don’t actually notice the damage before it’s too late and the hearing loss has already gotten to an extreme point. Manufacturing industry factories are required to offer ear protection to their workers, but many workers don’t choose to wear it because they don’t see the point, they feel like it slows them down, or they worry that they won’t hear important sounds. The construction industry is another noisy job, if you couldn’t tell by the sound of construction as you walk by! This is a very common occupation that deals with moderate to severe hearing loss directly as a result of the job. Many times, equipment that needs to be used has such a high volume that even workers with ear protection can undergo damage. It is also very difficult to put adequate hearing protection into place, since construction sites are temporary. Pounding music, loud people, and an enclosed space mean hearing damage for many nightlife industry employees. Many people have severe hearing loss after working in the entertainment or nightlife industry, as bartenders and waiters can’t wear earplugs on the job! This entry was posted on Friday, August 11th, 2017 at 10:54 am. Both comments and pings are currently closed.